This article was originally published by IPI Global Observatory on 16 April 2018. 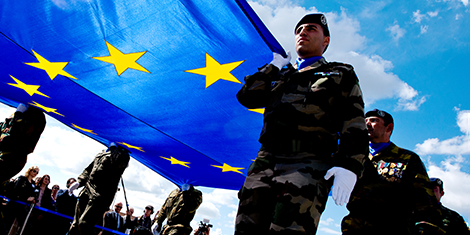 In November last year, 23 member states of the European Union (EU) made a historic decision to move defense cooperation from a mere political commitment to concrete action, through awakening what has been called “the sleeping beauty” of the 2009 Lisbon Treaty. The member states initiated the decision by signing a common notification on the Permanent Structured Cooperation on Defense (PESCO), which was transferred to the EU’s High Representative for Foreign Affairs and Security Policy, Federica Mogherini. Two additional member states joined the notification in December 2017, after which the EU Council adopted the decision to formally establish PESCO. PESCO is not just symbolically important, as it is made up of binding commitments. In concrete terms, this means that EU member states will work together on increasing investment in defense, on deploying armed forces together, and on cooperating on joint strategic arms projects. In addition to the commitments, 17 specific projects have so far been proposed by EU member states participating in PESCO that range from countering cyber threats and improving cyber security, to upgrading maritime surveillance, and establishing medical centers to support operations on the ground. The projects will be co-financed by the European Defense Fund and by individual member states. Yet, ironically, it is the United States that has recently voiced concerns over PESCO, for example during the NATO Defense Ministers Meeting in Brussels in February. Washington is worried that PESCO could duplicate NATO efforts and reduce US arms sales to Europe. It has called for transparency of PESCO procedures and openness for non-EU states. There is also worry that PESCO could lead to discrimination against non-EU members of the NATO Alliance. Indeed, the ambitious undertaking of defense cooperation by the member states comes at a critical moment, as the EU is facing significant internal and external challenges. Internally, the EU is weakened by the United Kingdom’s decision to leave the bloc. Furthermore, political cleavages running through Europe can be observed. While an obvious North-South cleavage has been present within the EU for some time, a new East-West line appeared in the last few years, especially since the onset of the migration crisis. The Visegrád Four—the Czech Republic, Hungary, Poland and Slovakia—look at the EU mainly as an economic project and have been critical of proposals by Germany to manage migration together via burden-sharing. Externally, the EU is threatened by increasingly complex challenges, including the migration crisis, the unpredictability of the Trump administration, terrorist attacks on European soil, and Russian assertiveness. In light of these challenges, the launch of PESCO can be seen as a resolute response by EU member states, a show of unity and a step towards further integration. Also, Brexit has actually removed one of the main obstacles to increased defense cooperation, with the UK long being opposed to it. While Trump, Brexit, and Russian President Vladimir Putin seem to have provided the EU with the necessary momentum to formally establish PESCO, there are also critics who say that the initiative is still mostly on paper and that the proposed projects are technical in nature rather than strategic. Also, it will be necessary to build a true European defense market to enhance the autonomy of the EU. In the new, first post-Brexit multiannual financial framework, 1.5 billion euros are budgeted for defense per year—0.5 billion for research, and 1 billion Euros per year for developing military capabilities. It remains to be seen whether this money will be approved. Despite the concerns of critics, it is now up to the EU member states that have decided to launch PESCO to grasp the opportunity and show the political will to engage in true strategic common cooperation on defense. Stephanie Liechtenstein is a freelance journalist based in Vienna, Austria. She is also the Web Editor-in-Chief of the Security and Human Rights Monitor. She previously held several positions at the Organisation for Security and Cooperation in Europe.